Why do I keep reading Mark Millar’s comics? Hell if I know. I guess he’s just enough of an ideasmith that I’m hopeful he’ll provide some entertaining stories a la Grant Morrison, so I keep giving him another try, yet I keep being disappointed. The saying goes that the definition of insanity is doing the same thing over and over again and expecting different results, so what does this say about me? 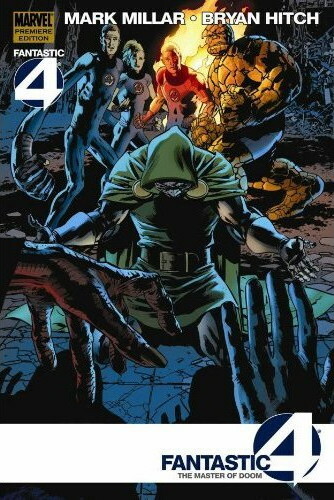 In the new Fantastic Four collection The Master of Doom, the second half of his run on the title with Bryan Hitch, Millar demonstrates how to write a really bad bunch of FF stories. The run produced lower sales numbers than you might expect from a run by a pair of supposed super-star creators, but frankly the quality just wasn’t there. Oh, Hitch’s art was nice enough, although stylistically he hasn’t really developed much since his days on The Authority: Toothy grins, near-photo-realistic renderings, rather blah layouts. But the writing is really awful. The next chapter starts with the Human Torch having brought a couple of, well, prostitutes or strippers or just plain sluts, back to his apartment when he’s interrupted. Oh yeah, the two women are dressed as Storm and the Scarlet Witch. Johnny may not be the most admirable member of the team, but this is a new low, and a clear indication that Millar just doesn’t understand the characters. This is followed by further foreshadowing of the arrival of Doom’s master, and then we get a 2-part Christmas story where the team goes to Scotland to visit a cousin of Reed’s. Valeria ends up being the intended sacrifice to a creature that’s been haunting the town for a long time. This is classic Millar: A bunch of superpowered characters hitting things, but no real consideration for the larger issues that he introduces, such as what the creature’s actually been doing for the whole time, even if the price it exacts is disgusting. Then we launch into the main story, about Doom’s master and the new apprentice arriving on Earth, being not at all pleased with Doom’s lack of progress in villainy, and disposing of the bad Doctor before turning to take down the Fantastic Four. The build-up to the master’s arrival involved him destroying whole parallel worlds, including killing one world’s Watcher, and there’s plenty of potential here: What sort of being would be so vile that he’d have been Doom’s teacher? Exactly when did Doom manage to hook up with an entity of such power, and why did he leave him? Why have they been out of touch for so many years? Heck, why did the master – with the rather generic name the Marquis of Death – leave Earth at all, given his predilection for destroying it? But Millar finesses all of this by making the Maquis a minor character with no real personality and just the barest of backgrounds, and the new apprentice a means to advance Doom’s character in a rather pointless manner, inasmuch as it’s just a set-up for further stories which Millar won’t be around to tell. And then, our FF manages to take down the pair through some trickery which somehow none of their parallel-world counterparts were able to envision. It doesn’t ring true. And none of the potential of the set-up is realized. It’s just a big slugfest. Zzzz. Millar wraps up the story with an utter cop-out of a resolution to the Thing’s engagement, which after Ben’s past relationships just seems completely unlike the character for him to handle things this way. Millar twists the characters to fit the story, and so the story just doesn’t work at all. Millar is one of the hottest writers in comics, and I just don’t get it: His writing is mean-spirited, poorly plotted, weakly characterized, goes for the cheap thrills and doesn’t realize the potential it does have. The Master of Doom illustrates all of this perfectly. Maybe the fact that it didn’t sell very well shows that readers are starting to realize this. I’d had hopes that, reined in by working on a major mainstream property, Millar’s Fantastic Four would be inventive and readable, more like what we see from Grant Morrison (when Morrison hasn’t himself gone astray), but this is just more of the same from Millar. This should probably be the last thing I read by him. Jim Steranko’s work on Nick Fury: Agent of S.H.I.E.L.D. 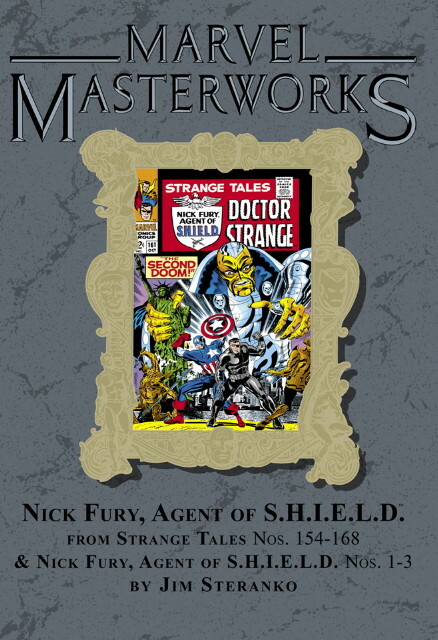 is legendary in the comics field, and it’s collected in hardcover this month in the latest Marvel Masterworks volume. (The pre-Steranko S.H.I.E.L.D. stories were collected a few years ago.) If you haven’t read them before, this is an outstanding package to read them in. Steranko, like so many of the prime innovators in sequential art, was before my time, and so coming to his work decades after it first appeared. It’s awkward, since Steranko’s Fury stories feel culturally dated, in part because he was consciously trying to make Fury and his friends feel like cutting-edge inhabitants of the real world, and the go-go world of the 1960s seems downright silly to most people who grew up after it (this is probably why today’s conservatives have so much fun pillorying the Flower Power generation). And besides that, so many of Steranko’s innovations in the field have been assimilated, reproduced, subverted and parodied in the years since, that they just don’t seem very, well, innovative. Plus, Steranko’s layouts and renderings have so much of Kirby in them, but without the sophisticated linework of a Pérez or a Byrne, that they seem dated in and of themselves. Yet Steranko’s work collected here does look different from his predecessors, contemporaries, and successors: The sense of place he provides in Nick’s apartment, the fantastic devices – less contrived than Kirby’s – that S.H.I.E.L.D. works with, the cinematic sense of pacing (which works sometimes yet fails badly at others, but then Steranko was always trying something new), and his gradual breaking free from the often mundane page layouts of the day (Marvel was ahead of DC in this regard, yet the page layouts of the late 60s, even by Kirby or John Buscema, seem downright staid). Despite being a bit of a mixed bag for the modern reader, Steranko’s S.H.I.E.L.D. still has a lot to offer, both its historical context, and some rock-em sock-em adventure. The premise of the book is simple: Nick Fury and his international spy organization fighting against Hydra, the Yellow Claw, and a mystery man named Scorpio, in comics’ best-known contribution to the 1960s spy craze. Plus the volume contains a fascinating introductory essay by Steranko regarding the approach he took to writing and drawing the book. If you’ve read any of Fury’s adventures over the last 30 years, well, even at his best they paled in comparison to Steranko’s stories here.